Willows Condo - walking distance to lift, restaurants and shopping. The Willows blends luxury lodging with boutique service. 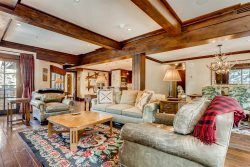 Located in the quiet neighborhood of Bishop Square nestled right in between the heart of Vail Village and Gondola One at the Village Base Area is a hidden gem that is convenient to all of the best that Vail has to offer. These beautiful residences are all adored with the same high end finishes including walnut floors, wolf ranges, subzero refrigerators.gas fireplace, daily maid service. Bedding: King in the master, two twins in the second bedroom (made up as a king on request) and a queen sleeper sofa in the living room.